Prkacin has a really interesting frame to bulk it up although he is already a strong player for his age and he uses his strength to beat opponents. He offers doubts in terms of growth because is not clear that he can add a couple of inches in the future. Prkacin is a powerful player but he lacks explosive in his lower body, he has heavy legs, and seems that he plays at the same pace during all the game. His coordination is pretty good and he runs the court very well. Prkacin likes to play open to face opponents and drive to the basket from perimeter but actually he does not have a jumpshot that we can talk. Should be a matter of time that he add a solid jumper to his offensive tools. Prkacin is an inside player that operates mostly from center position. He is developing good offensive tools to become a full time power forward but is still in the making. He is able to put the ball in the floor even dribble the ball but his skills are just average for a forward though. Prkacin is dominant in this age in the paint, he excels at low post and is very solid underneath finishing well with both hands. Playing isolations from perimeter Prkacin shows potential as a stretch forward but needs to add a reliable mid and long range shot to his skillset. Prkacin is a tough defender with competitive attitude that makes him hard to beat in the paint. He knows how to use his body to protect the basket and has no problem to guard any kind of inside player. He also excels in rebounds, having a good nose and doing the previous work to sweep boards. Prkacin is the son of former Croatian pro player Nikola Prkacin. He played already with youth Croatian national teams and participated with his team KK Cibona in some European tournaments earning recognitions and all-tournament team mentions. 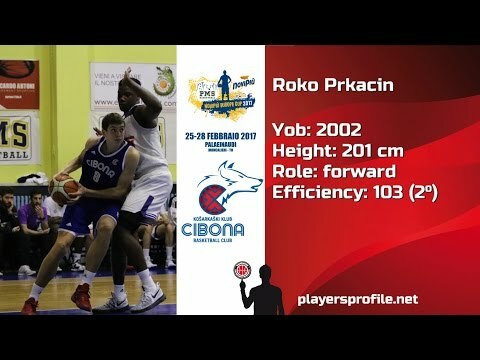 Roko Prkacin is a dominant player at U16 level but he needs to adjust his game to power forward position to avoid struggles in next levels.